Some topics are timeless. This is one of them. The term "Value Engineering" is not so familiar these days, since ostensibly it was developed by General Electric back in the World War II era. Per Wikipedia, "Value engineering (VE) is a systematic method to improve the "value" of goods or products and services by using an examination of function. Value, as defined, is the ratio of function to cost. Value can therefore be increased by either improving the function or reducing the cost. It is a primary tenet of value engineering that basic functions be preserved and not be reduced as a consequence of pursuing value improvements ." 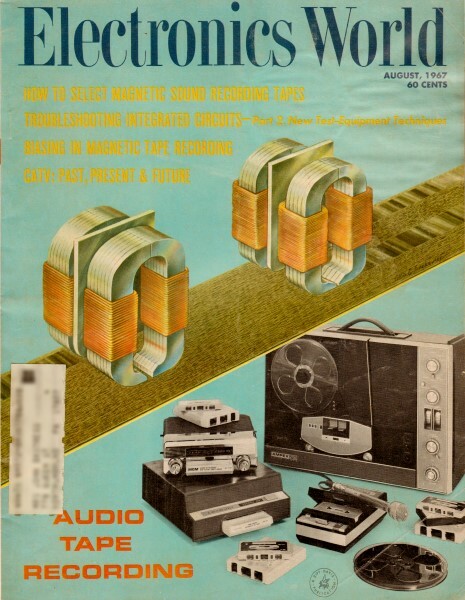 This article from the August 1967 Electronics World was a good read then, and it is a good read in 2019. A management philosophy of applying a forced organized approach to reducing costs while maintaining product quality. Many examples are included, showing what creative thinking' can do in this area. Value engineering is an organized attack on all elements which affect cost in order to provide a required function or product at an optimum price. These techniques can be applied to hardware, processes, schedules, or procedures. Since there is much confusion in the field, let us differentiate between value engineering and some of the other terms that appear to be part of this subject. Value analysis is the application of the techniques and philosophies of value engineering to existing designs or products. In many companies the terms "value engineering" and "value analysis'" are used interchangeably, but we prefer to separate them and consider value engineering the application to new designs and value analysis the application to existing designs or products. Cost reduction is the effort made to reduce the cost of a required item by analyzing the fabrication techniques and procedures necessary for its production. This means we do not consider ways of changing what is specified or required, but rather investigate methods of obtaining what is required at a lower cost. When this investigation is applied to the item's or procedure's function after the item has been designed, we call it "value analysis". When it is applied to the function of an item still to be designed, we call it "value engineering". Cost effectiveness analysis refers to optimizing the total cost of a product or a system, i.e., user's cost to purchase, service, repair, maintain, and satisfy the staffing requirements of a piece of equipment or system for a specified number of years. PERT is a technique for analyzing the occurrence of sequential and parallel events or operations in order to determine the path that is most critical in establishing the required output. Value engineering may be used to reduce or investigate the cost of specific events. Zero defects is a philosophy emphasizing each individual's importance in doing a job right, the first time. Zero-defects philosophy, therefore, applies to everything, including how the value-engineering job is done. Fig. 2 - Redesign of the molded-cable assembly used by General Electric Missile and Space Division. In the original design, custom molding was required and six types of cable assemblies were used. Typical costs for one type was $250 each, for an­other type was $940. 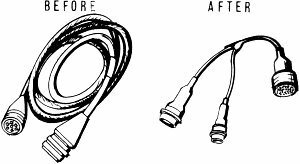 After value analysis was used, the leads, breakouts, and connectors were assembled using over­sized tubing, then heat-shrink tubing was used. Typical costs for each unit fell to $100 and $530 respectively. The total savings for manufacturer amounted to some $111,000 per year. Fig. 3 - The line drawing (top) illustrates the previous method used by Lockheed Electronics Co. to dispense color-coded wire. 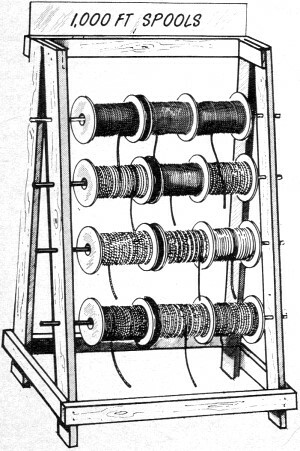 In this case individual spools of color-coded wire were purchased from an outside vendor. In new method, shown in the photo, white wire is bought and up to three colors are applied by the in-plant machine (bottom) to the exact lengths required for each job. This eliminated surplus and resulted in saving $43,500/yr. Fig. 4 - Modifications in printed-circuit card assembly used by Airborne Instruments Laboratory. The photos show that the handle (1) and frame (2) were removed, the connector (3) was replaced with printed contacts (4), and the test points (5) were replaced with a flow-soldered test strip (6). These changes resulted in a total unit savings of $85.25. The total quantity involved was 1200 units so that the total savings amounted to about $102,000. The implementation cost for the newer version was $20,000 for a total net savings of $ 82,000. Fig. 5 - A log i.f. 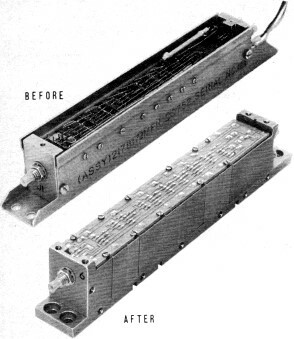 amplifier manufactured by Airborne Instruments Laboratory is shown before and after value analysis. The original version used built-up sheet metal construction and welded interconnections. The newer version used a cast casing and soldered printed-circuit board. There was a per-unit savings of $50, resulting in a total savings of $50,000 for a 1000-unit run. The implementation cost in this particular case amounted 10 about $4500, resulting in $45,000 net saving. Fig. 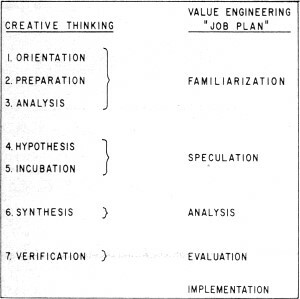 6 - Relation between the seven steps of creative problem solving and the five steps of the value engineering job plan. 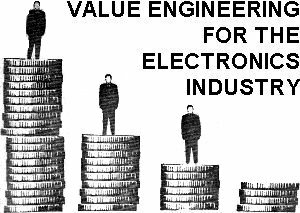 Value engineering is important to the electronics industry since it applies a forced organized approach to the reduction of the costs of all elements of the business. This is accomplished by taking a hard look at the individual element requirements and then determining first if the requirements are necessary, and second, how individual requirements may be met to yield optimum cost. This is not an attempt to reduce cost by reducing performance, reliability, or quality. Investigations have indicated that successful value-engineering efforts not only reduce cost and schedule, but usually improve other characteristics as well. In May 1964, The Department of Defense published a document entitled "Fringe Effects of Value Engineering" prepared by the special committee on value engineering of the American Ordnance Association. The report indicates that 44% of the 1961 changes investigated resulted in improvements in reliability while 1% did not; 40% improved and 2% decreased maintainability; 38% improved and none decreased quality; and 21% improved and 3% decreased performance. This is because successful value-engineering efforts usually simplify design, resulting in lower cost, increased quality and reliability, and improved maintainability. In each of the examples we will examine, the resultant new design reflects a careful investigation of each detail of the old design. In the first example shown in Fig. 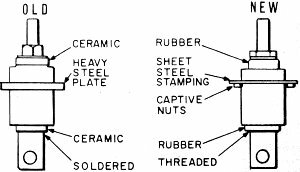 1, the heavy steel plate used in the capacitor required expensive machining while the redesigned piece is turned out as a stamping. The soldered connection is replaced by an easily produced and assembled threaded part while the relatively expensive ceramic parts, which were not required, were replaced by molded rubber parts. Fig. 2 not only illustrates a cost saving obtained by replacing a custom-molded assembly with an easily made harness enclosed in heat-shrinkable tubing but also demonstrates the possibility of obtaining "fringe-effect" improvements. In this case there was improved quality control as well as ease of repair and modification. Fig. 3 is an excellent example of value analysis as applied to a fabrication process. In this case the end product is the same, yet there is an appreciable annual saving. Individual spools of color-coded wire always present a problem in that they rarely come out even with the run or not enough of a given color is available when needed. 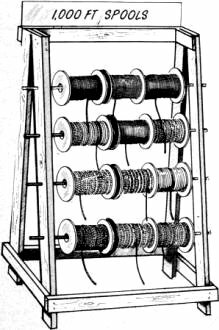 In addition, when a small amount of a particular color-coded wire is required, it is necessary to obtain a whole spool. In-plant color coding of white wire provided the solution. Fig. 4 illustrates the application of value analysis to a product that had been in use for some time. In this case the initial design was developed for a specific application and then adopted by a number of programs for other uses. The initial design permitted the handle, frame, and connector to be eliminated if desired. But this fact was forgotten from the time of the initial design until the assembly's latest application. This example illustrates the importance of continually reviewing products and designs even when they are acceptable and have been in use for a fairly long time. Fig. 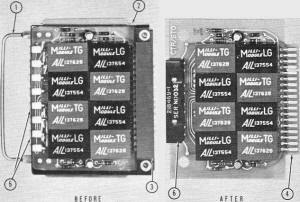 5 is still another example of a change in design which resulted in less costly fabrication techniques. The built-up sheet metal structure was replaced by a precision casting and the welded interconnections by a soldered printed-circuit board. This was done when a thorough analysis indicated that the change from welding to soldering was possible and that an increase in quantity allowed use of more expensive tooling. In smaller quantities, the sheet metal structure was less expensive and for other environments the welding was found necessary. These five examples clearly indicate that there is no one way to solve a problem and what is an excellent solution a one time may be less than optimum at other times. 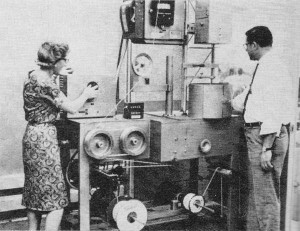 Value engineering developed as the result of discussions held some time prior to 1947 in the Purchasing Department at General Electric. The individuals involved recalled that during World War II it was necessary to locate substitutes for the required materials. Many times, it was discovered that the alternate proved far superior, both in cost and function, to the material that had been originally specified. Mr. Larry Miles, who is considered to be the "father of value engineering," was given the responsibility of developing this technique. In the course of investigating the various techniques employed, it was found that the individuals most successful at it were those using creative thinking. If we review the usual texts on creative thinking or creative problem solving, we find that a seven-step procedure is involved: 1. orientation, 2. preparation, 3. analysis, 4. hypothesis, 5. incubation, 6 synthesis, and 7. verification . These steps have been changed slightly by the value-engineering people and are referred to as the "job plan." Some companies use seven steps, some five. When five are used the form becomes: 1. familiarization, 2. speculation, 3 analysis, 4. evaluation, and 5. implementation. The relation between the five steps of the job plan and the seven steps of creative problem solving is shown in Fig. 6. 1. Familiarization. During the familiarization phase all effort is concentrated on understanding and defining the required function. An attempt is made to define the primary function in two words: one a verb, the other a noun. In this way, one is forced to define the central purpose of the effort in unambiguous terms. During this phase, a solution is not attempted. This produces a problem-oriented rather than a solution-oriented attack. It also overcomes one of the greatest handicaps to problem solving-a misstatement of the problem. 2. Speculation. This step involves listing all possible solutions. An important characteristic of this step is the fact that no attempt is made to justify or criticize any of the suggested solutions. By not being critical of any of the solutions, freer thinking is encouraged. This is extremely effective when a number of individuals are involved and is very close to the technique of "brain-storming" which was popular with some industries a few years ago. Included in this speculation phase is an "incubation" period. This is a time when the mind is allowed to concentrate on other matters with the solution to the primary problem coming as a ''bolt from the blue". 3. Analysis. The analysis phase critically reviews the ideas generated during the speculation phase with a view to developing an optimum solution. Many times a number of possible solutions are advanced during this phase. The output of this phase is one or a limited number of complete solutions which are then evaluated. 4. Evaluation. During evaluation, the solution or solutions developed during the preceding phase are completely evaluated. Back-up data is collected or generated and a complete solution is documented. If a number of solutions are offered, these are ranked in some manner so that a final selection may be made. 5. Implementation. The "job plan" is set up so that a solution to the value problem may be found either by a team or by an individual. The individual may be a value expert working in a staff position or a design engineer authorized to make his own decisions. Implementation in this latter case is no problem. Implementation in the case of the value expert may present some problems so it is included as a discrete step in the plan. In this way, the entire effort is covered from investigation to solution. Value engineering has embraced the whole subject of creative thinking and placed it in a new context. The success of the technique is due to its vigorous application and from forcing people to think toward a goal. In value engineering, this goal can be stated as the least cost for a function. Value can mean prestige value, aesthetic value, resale value, or use value. We are interested in use value. Use value is the lowest cost that can be obtained while still providing the required function or service. Many times this is expressed as V = F/C where V is value, F is function, and C is cost. We are trying to obtain the greatest value for a given function and obtain this function for the least cost. "Least" is a relative term since in actuality we usually work to a definable or target cost. Value engineering is a staff function which provides value information, assistance, and training to other departments. It is responsible for guidance and information - not direction. It provides a check and balance system for the cost characteristics of a design or procedure. The relationship between the value engineer and the design engineer has been a matter of concern ever since the inception of value engineering. The degree of this concern involves the maturity of the organization and the type of business in which the company is involved. Where the company is predominantly development-oriented with a small production business, value engineering has had limited acceptance. Where the company is product-oriented with emphasis on production, value engineering has usually been well received. In the first case, emphasis is placed on developing a product within a tight schedule and on a limited budget. In the second case, design for production involves a product which can be produced for a pre-determined cost. Additional investment to achieve this goal can be amortized over a large production run. In this environment value engineering has thrived and the usefulness of the value engineer is very well understood and his services are fully utilized. It is important to realize that value engineering cannot be utilized effectively on all projects or even within all companies. As the type of program or project approaches the research area, value engineering is of less use. This is because the cost of the hardware, procedures, or equipment is such a small part of the project cost. As the cost of hardware, procedures, or equipment increases, however, the usefulness of and need for value engineering also increases. Electronics organizations holding government contracts have acquired industrial "know how" over the past 20 years working on the relatively low-risk cost-plus-fixed-fee contracts. The usual measure of such an organization was its ability to solve problems within the schedule. Within broad limits, profit in terms of return on investment, didn't take into account how the work was done but whether or not the company could meet the contract deadline. With a change in both procurement policies and the competitive environment, the entire picture has changed. Not only is the profit potential greater but the risk of loss is greater. The vigorous application of value-engineering principles and philosophies is one of the most important shelters available to manufacturers in this new environment. Introducing value engineering into an existing company framework is an extremely sensitive matter. If the company has a history and modus operandi for utilizing corporate or division staffs, this is an acceptable and useful organizational set up. If this prior acceptance and use has not been established, value engineering will have to be introduced in the department where it will receive maximum utilization. This will eliminate the problem of the "outsider." No matter how mature and intelligent department personnel may be, design assistance from outside groups is rarely accepted with enthusiasm. Where value engineering personnel should be placed is also dependent on whether their primary function will be in value engineering or value analysis. If they will be concerned primarily with value engineering, they should work out of the product-engineering department. On the other hand, if the primary activity is to be value analysis, personnel can be assigned on a much more flexible basis. In a company where the responsibility for product improvement rests with the original design group, value-analysis personnel should be attached to the product-engineering department. If some other department is responsible for product improvement, say, purchasing or manufacturing, the value-analysis group should be attached to that department. Because value engineering is a relatively new "profession," some confusion exists as to the qualifications required of a value engineer. It is doubtful that such a man exists in "newly minted" form since one of the requirements is experience. He must have a broad background to enable him to understand the multiple facets of the problem and sufficient information regarding allied fields to seek the solution there if that is the answer. He must be mature enough to accept honest differences of opinion and senior enough to be respected for his views. These basic requirements can be met only after a number of years of experience - ten seems to be the minimum. The requisite experience should be acquired in creative rather than analytical fields. In addition, special training in creative problem solving techniques will be required - usually via work-shop training seminars. The Department of Defense has always been an enthusiastic supporter of value engineering and continues to push the technique as a means of reducing costs. To this end. the Armed Service Procurement Regulations incorporate contract provisions for value engineering. These are of two types: one is called Value Engineering Program Requirements, the other Value Engineering Incentive Provisions. The Program Requirements define the value-engineering effort and specify the amount of effort to be expanded as an item of the contract. Cost reductions resulting rom this effort are shared on a pre-negotiated basis with the customer. The Value Engineering Incentive Provisions do not require any specified amount of effort, are not funded as an item of the contract, but do include provisions for sharing any savings. The contract-sharing benefits that are available under the incentive provisions are more liberal than under the program requirement. In addition to saving-sharing available on existing (referred to as instant) contracts, provision is made for sharing savings realized on future purchases by the customer as well as other customer collateral savings. Value engineering includes the application of philosophies and principles that are far from new. All have been used by individuals and groups both now and in the past. (This is particularly true in the case of electronics firms which make products for the commercial and consumer markets as contrasted with those whose principal customer has been the U.S. Government. - Editor) What has happened in the past few years is that all of these programs have been coordinated in a number of defense-oriented industries into a useful technique. As is the case with most new approaches, value engineering has encountered some resistance. Most electronics firms have never seen fit to divorce development design from product design and have continued to handle both functions within the same department. Shorter contract schedules and limited production runs have seemingly justified this approach. Yet it is a fact that it is virtually impossible to handle development and production at the same time, as one area invariably suffers. The experience with government electronics contracts has been that the cost portion of the formula has been the loser as optimum production costs cannot be obtained during the development phase. On the other hand, value-engineering efforts, especially the cost-target approach, can do much to improve the costs of limited-production items with short development schedules. As competition grows, more companies will discover that the application of value engineering can improve control of product costs and thus improve their market position and their profits. This will only happen if they investigate the tools available and then apply them in the manner which best fits their philosophies.